Is there anyone out there that would mind sharing a their file for the inserts? I have the standard 16x16 shapeoko 3. Does anybody have a file for the XL? Winston Moe (@wmoy ) does. Let’s all ask him for a copy. I posted my files to my site, along with a list of considerations/disclaimers. If you want to use different inserts, just export your own DXF from the F360 project file linked. Thanks Winston (@wmoy, but that’s the problem with having an Eidetic memory. Board size: 16" x 32"
X0 Y0 location is 1.0" away from the bottom and left edge. To clarify, X0 Y0 in the file is the location of the lower left hole. The wasteboard volume you see in the F360 previews is not to scale w.r.t. the actual S3XL wasteboard. Awesome!!! Should I assume that the depths are set to work with the thickness of the factory XL waste board? Please read his (Winston) article. He talks about the depth. I made a Fusion 360 file out of the waste board with the screw holes for the Shapeoko XL/XXL frame. Feel free to reference or use as a template. Feedback is welcome! And here is a threaded version of the template. I used the hole dimensions from Winston’s Fusion 360 file. This was one of the first issues I had to overcome when I got my SO3, I saw winston’s videos and copied the idea (imitation being the sincerest form of flattery). 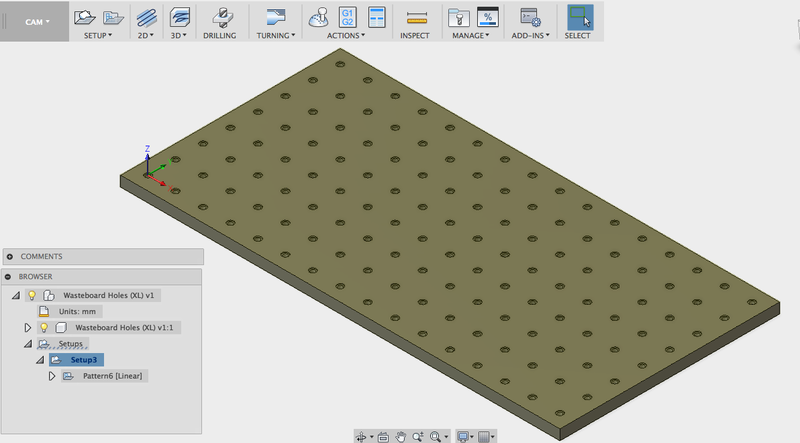 I have created both a PDF (export from solidworks drw), a dxf (importable directly into Carbide Create, and I started a C2D that showed how I did the toolpaths. Copy, modify, etc. Use it as you need it! Shapeoko-Parts - These are parts I designed when I was setting up my Shapeoko 3 that have made life a lot easier. They are great first-step projects and are all made from MDF. So I am a total newb here. I am looking to make a threaded wasteboard for the 3 xl. any files or recommendations? I thought I saw a file for it on here as well as some nice clamps someone did.